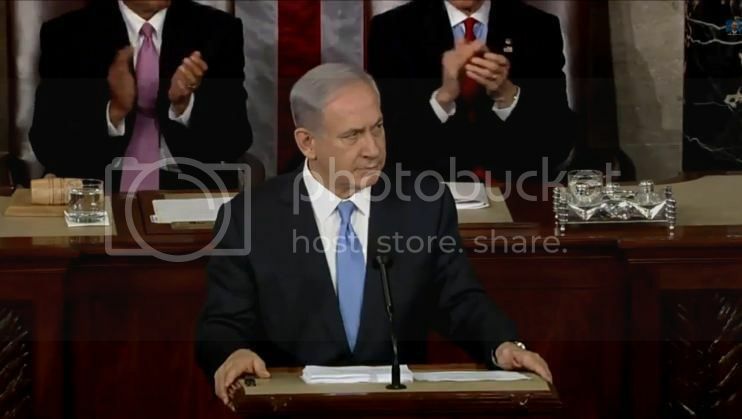 Israeli Prime Minister Benjamin Netanyahu delivered his controversial speech to Congress on Iran Tuesday. I just posted this over at CTH. I am out for the evening. I just listened to Netanyahu. This is a bad deal. We are better off without it, a better deal which Israel and its neighbors may not like but which we could live…literally. I dislike Obama all the more for making Netanyahu come and beg before the world for sanity and goodness to rule, for the survival of his country. His people. Other than his two simple words about Obama’s nuclear deal with Iran I disagree (such a polite way of telling O to go F’ himself. ) IMO this was the most important part of his speech. And what a perfect picture painter Netanyahu is, President Obamas wants to give the guys with butcher knives the nuclear bomb. It was a treasure trove of truth and diginity which had me in tears from the beginning to the end. God speed Bibi! I couldn’t love you more. It is a shame that so many Americans are anesthetized to the truth so that these words do not mean anything to them. And the willful leaders of the minions sit idly by, with their fingers in their ears sticking out their tongues because they can not face reality. Netanyahu was “Churchillian” and “Reaganesque” all at once. If we are destroyed as a civilized world it will not be because Netanyahu did not warn us. Chris Mathews, Nancy Pelosi, et al. are in for quite a surprise if they get the world they are pushing for. The idea of Pelosi in a full burqa is perhaps the only appealing aspect of any of this. I find it hard to believe that Iran could be trusted in any deal. That is because Iran can not be trusted. Netanyahu was incredulous when he said that Iran was blowing up a mock US carrier while they were sitting down and sipping tea with US representatives about how Iran would not be an aggressive power in the world. Well the poor thing was so upset over hearing Netanyahu's insulting speech that she almost cried. Have some pity yes? I am only one American citizen, but Netanyahu has my full support!!! Me too seeing-eye, there are a lot of us but the media is not so fond of Netanyahu, Israel or those who support Israel, so we do not exist in their world. And yes Packy maybe I will send Pelosi a mourning locket with the word dignity written in the locket, what a piece of work she is. Well, you're right. The media is not Netanyahu's friend or Israel's friend. I believe the only people the media influences are those who pay no attention to the world around them and believe the lies the media tells them. But from what I've seen, many people are beginning to wake up and see for themselves. I can only hope that it continues because I think we're in a very scary world right now. And it's getting scarier by the minute!! I call it the TMZ Nation. I believe people are waking up I'm just not sure that it will be soon enough. I hope that I am wrong. I don't think you're wrong. But I do hope you are too. The media overall has not been our friend as far as i'm concerned. I stand with Israel. Agreed Packy. The media is a pack of biased minions. As to it being too late for our country to right itself, time will tell. If our leaders keep vilifying the good guys and glorifying the thugs, then it is to hell in a hand basket and no way back. A ship can only take on so much water.